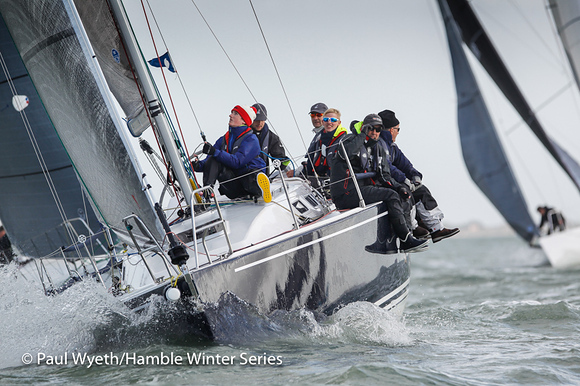 The fifth week of HYS Hamble Winter Series coincided with Remembrance Sunday and the 100th Anniversary of Armistice day for World War 1. The first warning was put back until after the 11.00 am two minutes silence, and Jonathan Blanchard, played the Last Post, live from the deck of Skirmisher his Kerr 36. The Committee Boat set up station at 4S (Royal Southern) in 20 knots of breeze from 240 degrees and with "Yankee" flying once again. With the breeze forecast to increase, Race Officer Steve Parry decided on a two course strategy for the day. 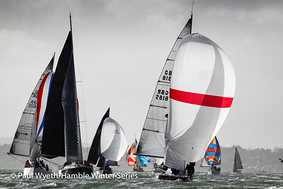 The bigger boats in Class 1 and 2 would disappear off round the cans, whilst Class 3 and 4 would be kept close on a 1.6 mile Windward/ Leeward so that they could be shortened if the worst of the forecast came to pass. As it turned out the smaller boats managed the three rounds of the course though with varying degrees of skill and technique, especially down wind. Windward/Leewards with their associated gybes downwind are not everybody's cup of tea in these conditions, though not many would manage tea anyway. Imptish, Barney Smith, had the Mothering Sunday of all broaches when forced offline by a non-right of way competitor. Tanya Robinson on the Committee Boat confirmed that "the broach was pretty legendary". With water in the bowman's boots and the cockpit awash there was no time to find a red flag let alone display one. How smart was Barney's dad on his 75th birthday, when he decided to sail his Solo rather than take the safer option of an Impala? Dudley Stock in Extract, X302, reported that "They made their three mistakes all in one go!" The main would not release on a tack, Dudley fell over and in the ensuing chaos a rope went round the rudder which hampered their recovery. On M'Enfin! ?, Corby 25, a gust of 92 knots was seen on the read out. Bertrand and Sophie have promised to recalibrate the Instruments before next weekend. Up in Classes 1 & 2, there was plenty of action too. The beat took the fleet to 3S (Royal Thames) where there was an interesting split. The asymmetric boats mostly gybe set, but Malice, Mike Moxley and Hot Rats, Robbie and Lis Robinson, made ground by using the last of the East going tide with a bear away set and then gybing when meeting the West going tide on the North shore. 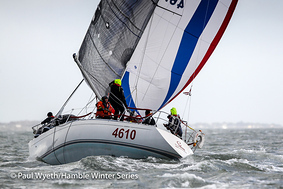 The second downwind leg hoists at West Ryde Middle were dramatic as they coincided with a 30 – 33 knot squall. The J88's appeared to come off worst with spectacular broaches and indeed Raging Bull, Tim Tolcher, suffered a MOB. Some quick thinking aboard Malice, who stood by the incident, meant that the MOB was recovered. 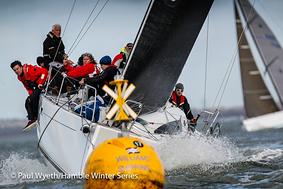 Further down the leg the J109s Jago, Mike & Susie Yates and Jiraffe, Simon Perry, battling for 1st place could not afford to white sail. Jolly Jack Tar, RNSA and Hot Rats decided to consolidate their 3rd and 4th positions and white sailed home past a number of Class 1 & 2 kiting casualties. In Class 1, Sailplane, Rob Bottomley took revenge on Davanti Tyres, Chaz Ivill & Paul Heyes by beating them both on the water and by corrected time to reduce the gap overall to 7 points. Pegasus DekMarx, Malcolm Wootton also beat Davanti Tyres on the water but had to settle for third on handicap. 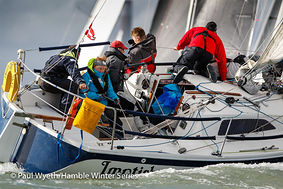 In Class 2, Jiraffe held on to beat Jago by 2minutes and 19 seconds with Jolly Jack Tar in 3rd. It was With Alacrity weather again and Chris and Venessa Choules duly brought her home first in Class 3. 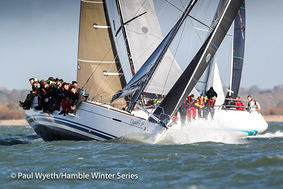 The J92, J'ronimo, David Greenhalgh, was only 1 minute 20 seconds behind on the water and even closer on handicap. J'ronimo was sailed by Libby again which allowed David to enjoy some golfing on the Algarve last week. Though, sportingly, he made it to the bar to celebrate her success whilst mumbling on about a torn spinnaker. There's no pleasing some owners! Scarlet Jester, Jamie Muir, was only 4 seconds corrected off J'ronimo in third, to keep the pressure on With Alacrity in the series. In Class 4, M'Enfin! ?, screeched round the course to win line honours fromFlashheart, Jeffrey Dakin. However, the positions were reversed when the times were corrected. Stan the Boat, Toby Gorman, was third and is now six points ahead of M'Enfin!? in the series. There was much praise for the Race team for both suffering the conditions and putting on a great race for everyone. How great of course depends on your view point. Back in the clubhouse, Athena Rossi, of Force 4, presented the day prizes. No doubt there will be some brisk business at Force 4 this week replacing broken and strained parts. 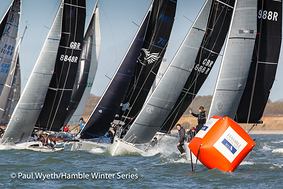 Next week, One Sails are the day sponsor.